Inspired by the Pope's encyclical? Want to put your faith into action? The livesimply award enables you to strengthen the bonds of community, nourish your spiritual life and care for God's gift of creation. 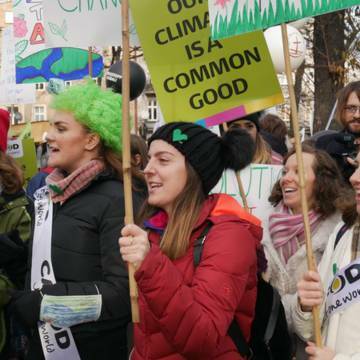 Some livesimply award communities have encouraged people to walk or cycle to church or school, install solar panels, start recycling schemes, join a climate change campaign, support Fairtrade stalls or donate to a local food bank. The award celebrates what you have already done and inspires you to do more. It helps your community to live, not just more simply, but also more fully. How can we apply for a livesimply award? Sign up using the form below to express your interest. Next, develop a simple plan, using this action plan template, based on current activities and new projects you’d like to undertake, and send it to CAFOD. When we receive your form, we will send you a livesimply award registration certificate to display in your community. We’ll support you with an email group, resources and the opportunity to share ideas and experience. When you’re ready, let us know and we’ll come and visit your community, find out what you’ve been doing and help you celebrate and share your achievements. Check out our step-by-step guide or sign up below to get started. You need the backing of your parish priest or head teacher, and a small enthusiastic group to encourage people to get started. Yes, I’d like join the email group for livesimply communities. Presentation for parishes, schools and groups who are interested in participating in CAFOD's livesimply scheme. A short talk to help you introduce the livesimply award to your parish or other community group. A practical guide for Catholic parishes and communities to reduce emissions and take action on climate change. This guide is produced by the Global Catholic Climate Movement, as a response to Laudato Si', and includes examples from all over the world. Starting on the livesimply award with your parish, school or community? Check out these 100 ideas for inspiration for living simply, sustainably and in solidarity with people in poverty. Examples and ideas from livesimply award communities in Westminster diocese. Start your journey to achieving a livesimply award in your parish, school, retreat centre, chaplaincy or other community. Use this simple form to plan how you will work towards the award, and return to CAFOD to get your registration certificate. Everything you need to know to get your parish, school, chaplaincy or religious community to live more simply, sustainably and in solidarity with people in poverty - and to start your journey towards achieving a livesimply award. A study guide inspired by Pope Francis' encyclical, Laudato Si'- Care for our common home from CAFOD and SCIAF. Includes witnesses from overseas and UK parishes, ideas for action and prayers. A guide on how you can respond to the encyclical by taking action on your own or as part of a community. Hymn for parishes, to celebrate living simply.